Philadelphia City Commissioners approved a new voting system in the face of objections about costs, transparency, and favoritism from a city official and civic groups. The three city commissioners voted on Wednesday in favor of two vendors to supply voting machines and electronic poll books that some estimate to cost upwards of $60 million. 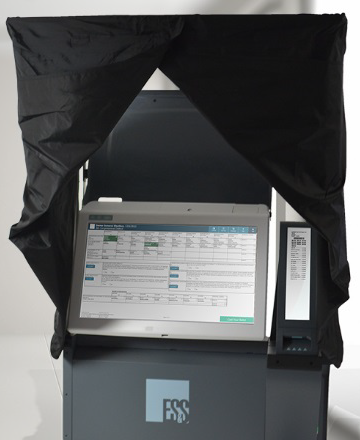 The commissioners chose the ExpressVote XL voting system by Election Systems & Software, LLC and KNOWiNK LLC to provide electronic poll books. The city last upgraded its voting machine system in 2002. City Controller Rebecca Rhynhart, who attended the meeting, said the selection process lacked openness with voters and appeared to favor a digital system. She also questioned where the additional funds to pay for the system will come from. Several civic groups — Neighborhood Networks, Citizens for Better Elections, MarchOnHarrisburg, IndivisiblePhiladelphia, Turn PA Blue — said in a released statement after the vote that they were committed to challenging the decision. “If we cannot trust that our votes are accurately and securely counted, our democracy is in jeopardy,” the groups said. City Commissioner Chairwoman Lisa Deeley, a Democrat, blamed the rushed selection process on the state-mandated deadline to set up a new system by 2020. The commissioners, however, aim to have the new system up and running for November’s general election so they are not using it for the first time in a presidential election. “If we do not act and act now, we risk not being able to have an election next year,” Deeley said. Negotiations for final contracts and costs with the vendors remain ongoing. But upfront costs for the voting machines were expected to cost between $20 and $27 million, while the electronic poll books were estimated to cost $3 million, Deeley said. Over the next decade, the new system was expected to cost another $13 million. Training and new warehouse space for the machines were expected to cost another $7 million. Only $22 million has been set aside for a new voting system in the 2020 fiscal year budget. Mike Dunn, a spokesman for Mayor Jim Kenney, said in an email that the administration will support the City Commissioners in negotiating final contracts with the two vendors in preparation for launching the new system in November. “We’re hopeful that this extensive effort will meet the Commissioners’ plan to have new machines in place in time for the 2019 General Election, and to certainly meet the Governor’s mandate for the selection of new systems by year’s end and implementation in 2020,” Dunn said. The new voting machines will offer a screen for residents to vote on, similar to an iPad screen, Deeley said. The machines also will produce voter-verified paper ballots that are able to be audited, which is not possible with the city’s current machines. “Every vote will be auditable,” Deeley said. In addition to Deeley, the other city commissioners were Anthony Clark, a Democrat, and Vice Chair Al Schmidt, a Republican. All three face re-election this year. A handful of residents also condemned the selection process at the meeting, saying the commissioners ignored accessibility concerns for the handicapped, security issues, and more. Resident Rich Garella called the process “tainted” and called on commissioners to vote for a voting system that used hand-marked paper ballots. “This could have been an open process with public input and transparency and accountability,” he said. “With our democracy at risk … we need smart decisions on new voting systems in Philadelphia but today it appears the voters are going to be given short shrift,” added resident Stephen Strahs. Auditor General Eugene DePasquale recently said he was investigating the city’s selection process. The city solicited proposals between Nov. 30 and the end of December. A total of seven vendors responded — three voting machine vendors and four electronic poll book vendors. Only three vendors are currently certified to provide voting systems in the state. A selection committee recommended the commissioners choose from two vendors for each system. A selection committee made recommendations last week that further negotiations continue with the four total vendors who received the highest overall scores for voting machines and electronic poll books. For voting machine systems, the selection committee recommended the commission choose between Express Vote XL and Dominion Voting Systems Inc.; for electronic poll books, KNOWiNK LLC and Tenex Software Solutions. In a letter dated Feb. 16 to the commissioners, Interim Procurement Commissioner Monique Nesmith-Joyner recalculated the scores for the vendors, but did not recommend one vendor over another. ExpressVote XL scored slightly higher than Dominion Voting — 3.7 to 3 respectively — for the voting machine systems; while Tenex Software Solutions scored higher than KNOWiNK LLC — 4.27 to 4.16 respectively. Gov. Tom Wolf mandated that all counties put in place new voting systems by 2020 that provide a paper record of votes cast. Pennsylvania was one of 21 states targeted ahead of the 2016 election by Russian government operatives. The former chairwoman of the defunct state-led School Reform Commission is seeking a new role: At-large City Councilwoman.